A suggestion to send Arab troops to Syria will be considered by Arab League foreign ministers at their Saturday meeting in Cairo, according to Arab League Secretary-General Nabil Elaraby. Qatar’s emir, Sheikh Hamad bin Khalifa al-Thani, told CBS News on Saturday Arab troops may have to step in to halt the bloodshed in Syria. Arab observers already deployed in Syria have failed to stop the violence there. President Bashar al-Assad’s forces killed another 32 civilians across the country on Sunday, according to activists quoted today by Aljazeera. Amr Moussa, Elaraby’s predecessor at the helm of the Arab League and is now a serious contender for the presidency in Egypt, is openly supportive of Sheikh Hamad’s idea. “It’s a serious proposal that should be discussed by the Arab states to determine those for or against, which countries intend manning the force, and the force’s task. This suggestion should be mulled over in depth,” Moussa tells Lebanese an-Nahar daily’s Khalil Fleyhane in an exclusive interview published this morning. By mid-day local time today, an ongoing online public opinion poll running on the Aljazeera.net portal showed 83 percent of 10,372 respondents in favor of “sending Arab troops to Syria to protect demonstrators there.” Only 17 percent, or 1,759 respondents, had voted against by this time of writing. But it is far from clear what role would be envisaged for the Arab troops in Syria. Would they be mandated to serve as an interventional, deterrent or peacekeeping force? 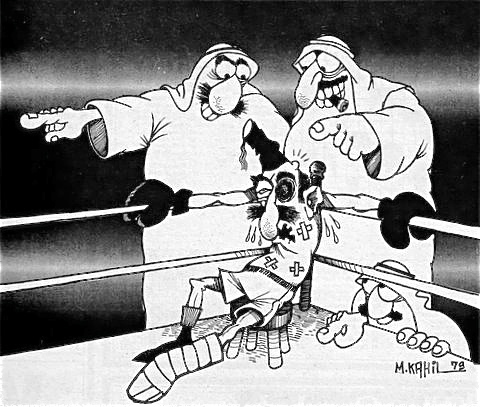 Some 35 years ago, the Arab League created a military intervention force to stop Lebanon’s civil war. When created in 1976, the so-called ADF (Arab Deterrent Force) originally comprised contingents from Syria, Saudi Arabia, Libya, Sudan, UAE, among others. By 1979, the ADF had metamorphosed into a purely Syrian occupation force that ruled Lebanon until 2005. “Is sending troops to Syria viable? Who will do that, given the do or die defense of Assad’s regime by Iraq, Algeria and Lebanon?” Tariq Alhomayed asks in his Monday editorial for the Saudi daily Asharq Alawsat. Should most Arab and foreign states want to stop the killing machine in Syria, he says, it’s not enough to send Arab troops there. The move should be made either under the aegis of the UN Security Council or through creation of what is known as a “coalition of the willing.” Its objective would be to carve a buffer zone in Syria with Turkey’s help. The zone would hasten the regime’s fall by encouraging mass defections from the Syrian army.